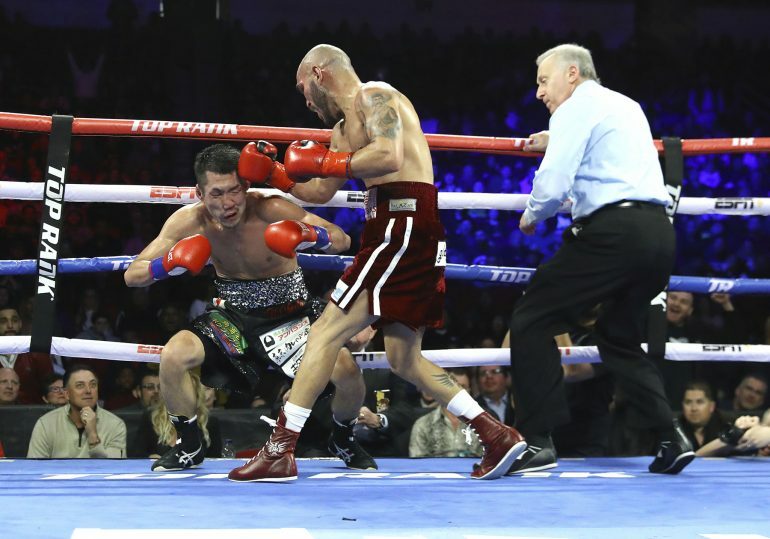 Ray Beltran broke down Hiroki Okada in an action-filled bout Sunday night, stopping him in round nine of their junior welterweight bout at the Save Mart Center in Fresno, California. It was Beltran’s first fight since losing by decision to Jose Pedraza on Aug. 25. Pedraza would claim the WBO lightweight title with the win. Beltran moved up in weight to face Okada, who won a close decision over Christian Soria in his last bout on Sept. 14. Both fighters went on the attack from the opening bell, but it was the second round that produced the best action during the fight. Beltran (36-8-1 1 NC, 22 knockouts) dropped Okada midway through the second round, connecting with a left hook to the head. Okada recovered to almost drop Beltran with a right cross later in the round. Both fighters continued to score in ebb-and-flow exchanges during the middle rounds. Okada landed straight rights hands to the head, resulting in bruising around both eyes of Beltran. The pace of the fight slowed during the second half of the fight. Okada pressed the action as Beltran’s punch output dropped. Beltran roared back during round nine, dropping Okada with a left-right combination to the head. Okada beat the count, but was dropped again near his corner, where his trainers threw in the towel. Referee Jack Weiss immediately stopped the fight at 2:09. At the time of the stoppage, Beltran was up 78-74 on card, while the other two judges had the fight even, 76-76. Beltran admitted he was stunned by the punch from Okada in round two. Beltran would like to remain at 140 pounds, but is open to moving down to the lightweight division. Okada, who resides in Tokyo, drops to 19-1 (13 KOs).